It’s been more than 60 years since anyone has tasted it… but her bread. They all remember her bread. The taste. The smell. The way it melted in your mouth. Funny, the things that stick in memories. She was born 144 years ago this past week, this great grandmother, my mother’s mother’s mother. A woman I don’t remember. And whose bread so many can’t forget. Eula and Jasper had four children in short order: the oldest, my grandmother Opal, in 1898,9, Fred in 1900,10 Harvey in 1902,11 and Ray in 1905.12 The first two were born in Texas, and the second two in the wild territory to the north then called Indian Territory, soon to be the State of Oklahoma. Jasper was a successful bidder in the opening of the Big Pasture in 1906,13 and the family began to farm the land in 1907. I can’t help but think these were the happy years for Eula. Her mother and stepfather and all of her brothers and sisters settled in the same area of Tillman County, Oklahoma. Her children were growing like weeds. She had land of her own and a young strong husband. Eula had no choice but to sell the land and move into town. To help support herself she took in boarders, among them her many nieces and nephews who came into town from country farms to attend school. And she continued to take them in and care for them as they went on to college — she was in essence the original dorm mom. It was thick and the crust was just the right consistency. It was filling and smelled like heaven. With butter and cinnamon and a little sugar, it might as well have been manna from heaven. It was breakfast, lunch, a meal in and of itself. There are surely worse things to be remembered for. I wish I did have the recipe, Roberta! Often, in that time, and much later, women cooked by “recipes” which they had grown up with and which may not originally have been written down but had been passed on by mothers and/or grandmothers who “understood” the science and art of cooking by doing a lot of it. My mother made biscuits which were “to die for” and I’ve only found one cook in a restaurant in Clarendon, Donley Co., TX, who came close. She couldn’t give me the recipe because she didn’t have one. 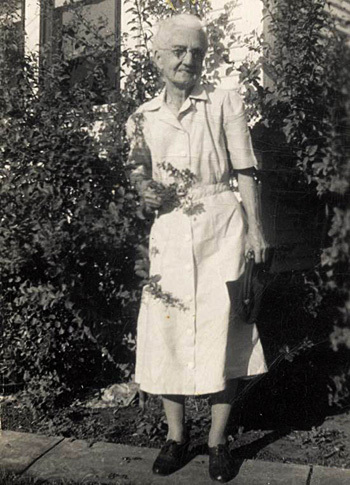 My maternal grandmother made pickled peaches which were absolutely fabulous and the same was true of that “recipe”—“a pinch of this and a dab of that” is how she described it to me. So, savor the fact that she is remembered by the bread she baked—some women were not good cooks and may have had nothing to be remember for. Have you checked if there are other copies of the census – say at the state archive? I solved a census problem on the 1885 NM census copy at the FHL. There was tape used to mend the page right where my great grandmother Helen Smith’s name was written. I remembered that several copies were prepared of censuses before 1890 and was lucky to find a legible copy at the NM State Archives. Maybe you can get the name on a different book? Thus far we have not been able to locate any copy of this particular census other than the federal copy. But we’re still looking! Would love to taste her bread! My favourite cooking activity – making 5 or 6 loaves of multi-everything bread! I swear it’s therapy for me! As for measuring, I only measure the cups of water – since each loaf needs about 1 cup… everything else is by-gosh-&-by-golly. The loaves turn out a bit different every time depending on what’s in my cupboards. This is a lovely post, Judy, and wonderful that people still remember Eula in such a warm way. Eula – such a sweet old-fashioned name, too. I really enjoyed reading today’s post. Ends with such a good feeling. You’re making me hungry, Celia! My (great) Aunt Julie was also known for her bread. Fortunately, we did get her to write down an approximation of her recipe, and now I’m known for her bread. Just wish I had time to bake it more often! Time — that dirty four-letter word! Glad you got the recipe, Dave. This reminded of my grandmother. She died when I was three, but everyone in the tiny town of Coolidge, Texas that I interviewed in the 90’s talked about her homemade rolls and coffee. Fortunately, the women’s club put together a cookbook every year. I have two copies and one has the recipe in it. One of her secrets was to double the yeist. BTW, big score on my paternal DNA yesterday. The third 67-marker match, one step removed came in. Following it up on several surnames with records available online, it is obvious that the family came to Texas from Laurens County, SC. I had been looking at Union County, where other relations were. Patience pays off. I tested my father before 2000. Nice that you have the recipe, Rondina! We have some of Eula’s but unless my cousin can find it in other papers, we don’t have this bread recipe. Congrats on the YDNA score! I bet that recipe is tucked in a book somewhere or family bible or a neighbor might have it. I had a pleasant surprise one day in the mail when a neighbor of my grandmother sent me favorite recipes in my grandmother’s handwriting. Love this story. I sure hope you’re right, Magda — I’d love to get a pleasant surprise like the delightful one you got! !